The top baby names fluctuate so much over the years, but it seems like some names pop up over and over throughout the decades. 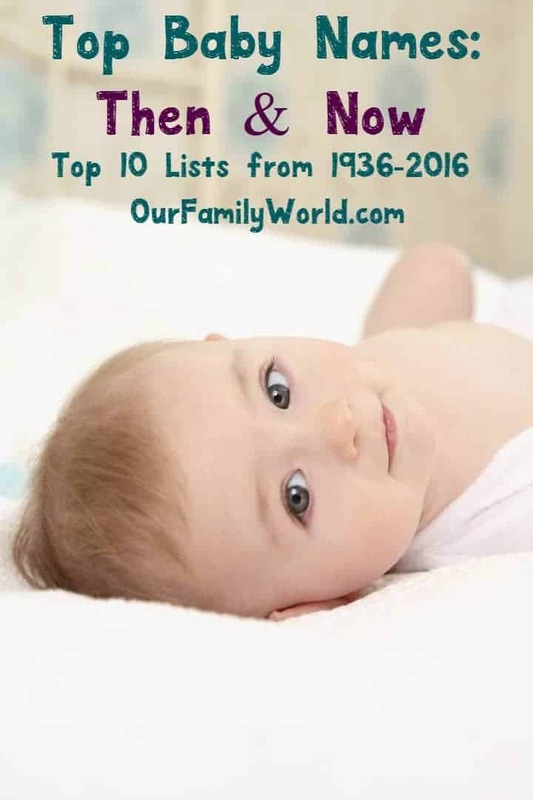 We thought it would be fun to take a look at the top 10 baby names throughout the years. We’re starting with 2016 (so far), then 2015 (since it’s the last full year that has data). Then we’ll journey back in time…all the way back to 1936. We will also take a look at famous people born during those years with the top baby names. Are your children’s names on any of these top baby names lists? In 2015, Mia Alma was born via surrogate to celebrity blogger Perez Hilton. Also, Princess Charlotte Elizabeth Diana was born to Prince William and Princess Kate. In 1995, the most popular name for girls was Jessica, but that changed in 1996 when Emily became the most popular baby name for girls. For the 36th year in a row, Michael remained the top baby name for boys. Born in 1996 include actress Rachel G. Fox, pop singer Austin Mahone, and actor Austin Abrams. Jennifer was the most popular baby name for girls for the 7th year in a row in 1976 while Michael remained at the top of the charts for baby names for boys. Born in 1976 include actor Michael Pena, actress Amy Smart, actress Amy Acker, actress Melissa Joan Hart, actress Jessica Capshaw and actress Michelle Monaghan. In 1936, Mary was the most popular baby name for girls, and 20 years later, it remained the top baby name for girls. Michael was the most popular baby name for boys. Born in 1956 include pop singer Debby Boone, actress Linda Hamilton, actor Bob Saget, magician David Copperfield, actor William Fichtner, and actor Tom Hanks. In 1936, Mary was the most popular name for girls for the 47th year in a row. Robert was the most popular boys name for the 13th year in a row. Born in 1936 include actor Robert Redford, actress Mary Tyler Moore, coach John Madden, U.S. Representative John McCain, country singer Charlie Daniels and actor David Carradine. As you can see, a few of the names pop up across the decades. William, Richard, and Michael, for example, will probably always be popular boys names. Girls names seem to fluctuate more. Maybe because boys are often named after their fathers more often than girls are named after their mothers? It will be interesting to see what these lists look like in another 20 years, don’t you think! It’s amazing to see how popular names changed over the years! Thanks for sharing!! A great list of names. To bad none of my kids names are on it. It is interesting how some names come full circle. I have a Cameron and a Claire Margaret. I love their names and think they fit them so well. This was really cool to look at! None of my kid’s names were on here but I am sure they are probably on the list of 100! I love to see the trends! Such a lot of unique names, If I was pregnant I would love to find a name there for my baby. I’m hearing a lot of Liams, that alone is true! Of course, no matter what their name is, the real people and kids behind it are still wonderful. The challenge (or fun) starts when you stay true to what your name means! It’s definitely interesting to see how popular names change (and come back round again). As a Jessica, I’m all too familiar with having a very overused name! These are indeed more common names that you see for each generation., My sons have uncommon names I believe which are Chace and Lance. I wanted uncommon or semi uncommon names. Thanks for sharing the information. There are names that we can’t seem to let go of. We might even consider them to be classics, lol. No matter, the names are really nice, no wonder parents always choose these names.